Author: Graham Furniss, Malami Buba, William Burgess. Series edited by: Wilhelm J.G. Möhlig. By the end of the 1980s, Hausa popular literature has been recovered in Nigeria by young people with a familiarity with reading, and the Hausa cultural creativity took a new turn. The books being produced were novellas with themes circling around the perennial issues of crime, violence, money, power, status, love, and marriage. Running through these themes are debates about modernity and tradition, often graphically represented on the front covers of the books. 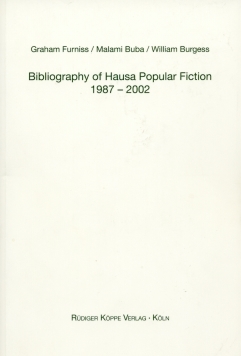 Many of the novellas being produced in Kano and elsewhere were being collected by Graham Furniss at the School of Oriental and African Studies (SOAS), University of London, to establish a preliminary catalogue which constituted a listing of some 731 printed volumes. Subsequent to this bibliography additional books will be entered into the electronic database. The authors of this volume had to solve numerous problems, the date of publication was seldom given, any indication of where or by whom a book was produced was often missing. And if there was an author’s name, the very variable spelling made the identification difficult. As a result the present book contains several lists in addition to the bibliography so the reader can search a book in an alphabetical list of titles, or in a list of titles translated into english. There is also an alphabetical list of authors, and all 731 cover images illustrated at the end of the volume. The aim of the database and this printed version, is to allow others to make use of a primary listing in establishing over the next years a definitive list of materials. Perhaps, needless to say, the book is as relevant to documenting a stage within Hausa writing as the novellas were to capturing the images of life in Hausa land within a certain span of their evolution. [...] Furniss et al. 's book is the pioneer and, to-date, the most authoritive documentation of that writing industry. Ibrahim Sheme in LEADERSHIP, Abuja, Nigeria, 1. August 2005, pp. Summing up, it is pertinent to say that the authors have done a very good job. Their guide to popular Hausa literature will be a useful working tool for both the Hausa readers and the scholars from abroad who are interested in the development of the modern Hausa literature.